On the panel: Moderator Patricia Sampaio from FGV Law School, Vice-Admiral Roberto Condim Carneiro da Cunha, ANTAQ Director Rodrigo Trajano, Lasse Karlsen, Technical Director of the Norwegian Maritime Authority, Petrobras executive Dimitrios Magalhaes and moderator Ricardo Fernandes, of Abran. Seminar debates green ambitions for the maritime and offshore sectors in Norway and Brazil. From the left: Ingvil Smines Tybring-Gjedde, Sergio Guerra and Sissel Hodne Steen. 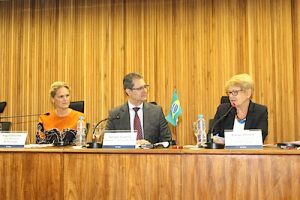 The 3rd Brazil x Norway seminar organized by Abran, FGV Law School and Team Norway took place on September 25, 2018, and the event presented a potential area for collaboration between Norway and Brazil, as well as an opportunity to compare Brazilian and Norwegian regulations of the maritime and ocean sectors. 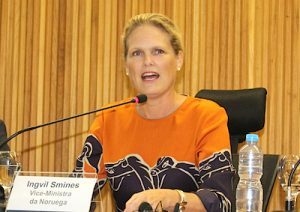 The keynote speaker was Deputy Minister of Petroleum and Energy, Mrs. Ingvil Smines Tybring-Gjedde, and she focused on the new, emerging ocean industries as a whole, not only on the maritime and oil and gas sectors. «The Norwegian government wants to make sustainable use of the oceans a top priority and we believe that the best protection is through responsible use of the oceans. We aim to promote value creating in the ocean industries, and the energy and maritime industries play an important part, as driving forces in the development of a blue economy. The maritime and energy sectors are part of the solution to the global challenges we are facing and we need to continue reducing emissions from the sector and develop greener and smarter operations. The key is to ensure a competitive and prosperous industry and protection of the marine environment, but this rests on the assumption that the industry must be part of the effort, that entails the development of new technologies, new products and services and new business models. Green solutions are good business and also good for the environment, and we need to find solutions to combat climate change», she said in her address to the seminar. The Deputy Minister gave several examples on how the Norwegian ocean industries are becoming the most innovative in the world. The giant Johan Sverdrup field, under development in the North Sea, will produce 660.000 barrels of oil equivalents by 2022, and will have 25 percent lower CO2 emissions per barrel than the world average. Kongsberg and Wilhelmsen recently founded the world´s first autonomous shipping company. Currently, Norway has 50 LNG vessels , half of the world´s LNG fleet, according to the presentation. «Norway is taking steps to stay ahead and to reduce our environmental footprint, and the autonomous shipping revolution is an important part of the green revolution. The winners of the green revolution will be the winners of 21st century global economy», the Deputy Minister said in her keynote speech. 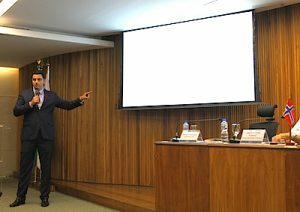 As the emerging ocean industries involve a variety of risks, realizing the full potential will demand a sustainable and responsible approach which also involves regulations and governance, and FGV professor Sérgio Guerra presented the Brazilian regulatory framework to the seminar. He also addressed the relevance to adapt to market changes and technological shifts in the maritime and offshore sectors. 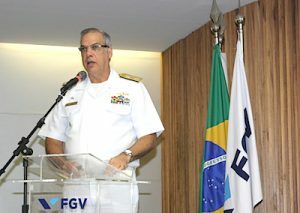 Vice-Admiral Roberto Condim Carneiro da Cunha (in the photo), Director of the Brazilian Directorate for Ports and Coast (DPC) explained the role of the Brazilian Maritime Authority and the challenges driven by the recovery of oil and gas activities in Brazil. The increasing demand from the oil and gas industry requires even more from Brazilian maritime authorities. «We are monitoring current positive economic indicators, but what we have seen, is a reduction in actions, inspections and also in the number of Norwegian vessels operating in Brazilian waters. Today, actions are being adopted to accompany the recovery of the industry. Procedures are being simplified, new measures have been adopted. 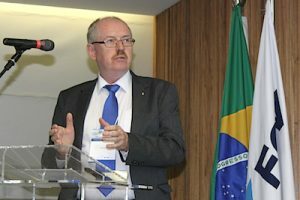 The Brazilian maritime authorities are ready to attend the needs of the industry in growth», he said. 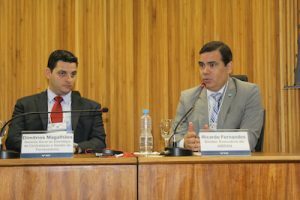 ANTAQ Director Rodrigo Trajano talked about the role of ANTAQ and the challenges brought by the recovery of the activities of oil and gas in Brazil. With the crisis, the number of maritime support vessels fell significantly, and many contracts were terminated early, mainly for foreign vessels. Many charter contracts were renegotiated. 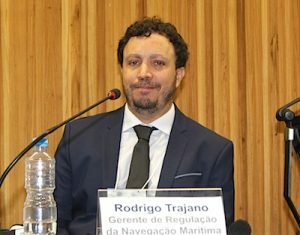 Mr. Trajano expects the demand for supply vessels, also foreign flagged vessels, to increase as huge developments by Petrobras and foreign oil majors are on the way. ANTAQ has also identified several regulatory demands in this process, involving charter by non-EBN (foreign vessels), ship-to-ship operations, chartering of vessels which perform submarine engineering work and the use to tonnage to charter foreign vessels without circularization. The concern for finding greener solutions was less evident in the presentations of Brazilian regulators, possibly because surviving in a market in crisis has been the sole priority to many players in the Brazilian maritime and offshore sector. The goal of the seminar was to share experiences, but the presentation of Mr. Lasse Karlsen, Technical Director of the Norwegian Maritime Authority, illustrated a gap when it comes to the green approach and search for greener solutions for the future. To the audience, however, the presentations from the Norwegian speakers served as an inspiration. Mr. Karlsen focused on the impact of new technologies and lower carbon emissions requirements on the regulation of the maritime and offshore sector. He also addressed the need for reducing emissions of greenhouse gases. IMO has decided to reduce emissions from shipping by 50 percent by 2050. 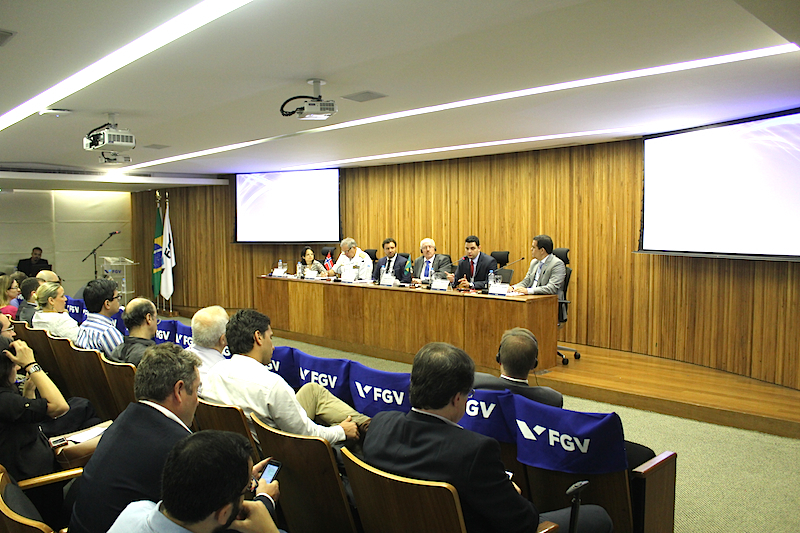 The last presentation of the event was given by Petrobras executive Dimitrios Magalhaes. He talked about the company´s perspectives of the future, new technological trends and how this reflects on the procurement strategies of Petrobras. «Petrobras aims to accompany new tendencies, and with pre-salt, we face different challenges and need suppliers with the appetite to face these challenges with us. Today we have 120 production units in our fleet, and needs within maintenance will also create opportunities», he said.